In light of the Holiday Season, we here at BFF thought it would be best to surround this month’s weekend guides with things that encompass the holiday theme. Last week we gave you a great Girls’ Holiday Night out idea and for this weekend (for those of you who dare), you and your BFF(s) can set up an Ugly Christmas Sweater Holiday Party! Decorate the house with some cute and funky holiday decoration. Cook up some good food or if you are on a budget, have your friends bring the food and you provide the drinks or vice versa. You can print up cute invitations or even send out e-invites through awesome sites such as pingg.com. 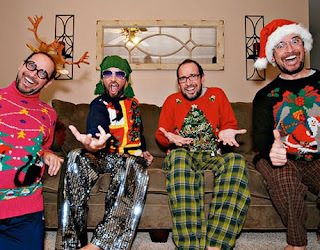 Make sure you note the one, absolute rule : everyone MUST come in an ugly Christmas sweater. If not, then what’s the point of having the party?! Imagine all of the hilarious pictures you and your friends will be able to laugh at for years! Cooking food and decorating sounding like too much work? For those of you 21 and over, you can even opt for an Ugly Christmas Sweater Holiday Bar – Hop. The laughs will increase as all of you will be seen in ugly sweaters out in public! Let us know what you have planned for this weekend. Drop a line below!